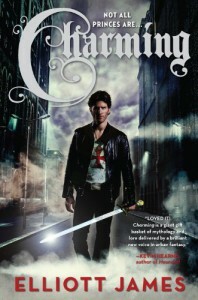 John Charming is from the line of Charmings, many of his ancestors have performed deeds which now live on in fairy tale. They were also knights who patrol the earth and eliminate any supernatural beings who would make themselves known. John was trained as a knight, but because of an accident when he was a fetus (seriously) he became half-werewolf (still serious) and while he was trained by them, he is also feared. Meanwhile, he's just trying to live a normal life bar tending. However, when a hot blonde and a vampire appear in his place of work, he gets drawn back into that life as they try to take down a vampire hive. I couldn't really get into this book. It had some funny lines and snarkiness, but I never connected with any of the characters. I may read another, but I'm not really sold on it. I think I wanted more of a fairytale aspect but I got an urban fantasy.